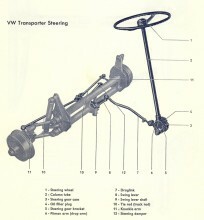 Steering box for 1955-67 VW Bus. This bus can be used just as the non locking steering boxes, but is intentended to be used with a European steering column lock. The shaft has a cutout for the lock to enter. There is a $300 core charge not included in the price but is refundable when we determine your oriignal box is rebuildable. Does not apply toward Brazilian steering boxes as they are not rebuildable. Click the button below to add the Bus Steering Box w Locking Column Sleeve - 1955-67 Rebuilt to your wish list.